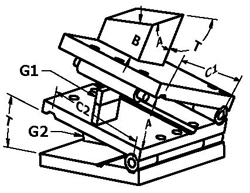 One uses a sineplate that you cn clamp stuff to.. This is something that could work as well if you dont need complex angles. Bigest problem is having the drill skid of off the angles face. Use an end mill first to get a flat spot for the drill. As I mentioned in the thread above, the method you chose is highly dependent on the level of accuracy you need. The fact that it's brass is inconsequential. Have a look at the thread linked above and if that doesn't give you enough ideas then post a lot more detail on what you're trying to accomplish. haha apparently, i havent read that thread yet. I usually never drill a angled hole at all, i just put a 2 flute or single flut mill in my drill press instead.. and run it down until i got a proper flat surface to start my drill at. But i only been doing propane burners, those swirly bits in the burner head.